Clients are sometimes embarrassed to ask questions about how a website works. They often don’t understand what their web hosting company does and why it’s important to have a good one. With that very question in mind, here’s a breakdown of the components of a website. Think of it as a guide to everything you wanted to know about how your website works but were afraid to ask. At a fundamental level you will need three things to make your website work. Let’s take a look at each of these components. Your website is a collection of pages that include text, images, forms, etc. Browsers read files, typically created using HTML (Hyper Text Markup Language), and display the information in a (hopefully) easy-to-read layout for your human readers. There are numerous file types that can make up the page or pages on your website. CSS (Cascading Style Sheet) files dictate the styles used; fonts, colors, etc. Just like a visitor to your home needs to know your address, a website visitor needs to know your web address. The terms “domain” and “URL” are often used interchangeably to refer to your website address. https://www.YourDomain.com and includes your domain. The term “web address” is a colloquialism rather than a technical term. For you to become the owner of the domain, you must register the domain. The provider through which you register your domain is your Domain Registrar. You will then need to point your domain to where your files are actually stored. For example, MyDomain.com might direct to 172.16.254.1 for example. This pointing is the process of turning your easy-to-remember domain name into the IP (Internet Protocol) address that computers use to identify each other in the vastness of the internet. The IP address is the computer where your website files are actually stored. These computers are called “servers” and they provide public access to your website files which is how your visitors see your website. Typically you will use a hosting company that owns the servers and provide you with the necessary permissions to upload your site’s files. There are different types of web hosting. The best option for you will depend upon your needs. Shared Hosting is pretty much as the name implies. You are sharing a server with other websites. This is great when you’re just starting out or have a small website with limited traffic. The downside is you may end up with neighbors whose sites can negatively impact your site’s performance. VPS is similar in that you are on a server with others. The important difference is that you each have a set allocation of the resources. This eliminates the issue of one site using up more RAM, for example, and slowing down your site. Cloud Hosting is very similar to VPS but instead of a single server there is a large network of computers acting like one gigantic server. Dedicated Hosting is where you have the server to yourself. You are not sharing resources with anyone. Managed WordPress Hosting is becoming more common as the popularity of WordPress continues to rise. A managed WordPress hosting account is specifically for WordPress sites and the hosting company will keep your WordPress installation and plugins up-to-date. Bear in mind, that a managed WordPress account does not offer the ability to set up domain-based emails such as info@MyDomain.com. You’ll want to consider the type of support you’ll get when selecting a hosting company. An important consideration is what happens if there is a glitch. If there is an email issue or the site goes down, who is responsible for acting to fix the issue? An Uptime Guarantee should be another consideration at the top of your list. Most reputable providers offer a 99 percent uptime guarantee. Another important consideration is ensuring adequate backup. How often will they be backing up your data? If you will be creating domain-based email addresses, such as MyName@MyDomain.com, you’ll need access to your servers to do that. Typically that is done through a Control Panel. Strictly speaking, you don’t need an SSL to have a functioning website. I’ve included it in this article because you really should have one anyway. 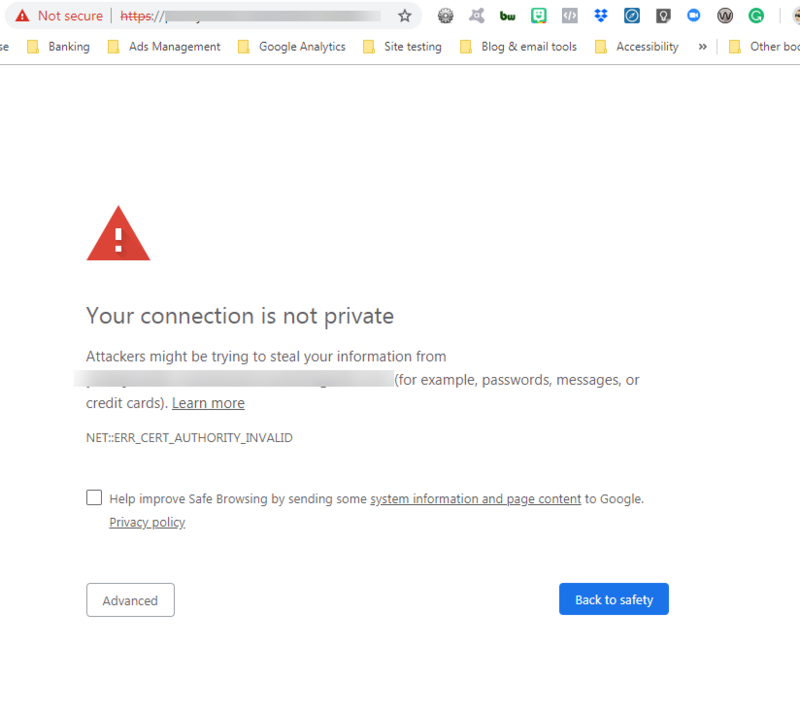 An SSL is a Secure Socket Layer that authenticates your organizations details and allows a secure connection between your server and a user’s browser. When applied it will show a padlock and HTTPS protocol in the browser’s address bar. Most browsers now show some type of alert to visitors who land on a site without an SSL with Google Chrome being the most aggressive. You can get an SSL through most hosting companies or through a vendor such as Commodo or GeoTrust. Now that you have everything set up, make sure you keep the name of your domain registrar and your account credentials in a safe place! These two pieces of information are vital. You will need your login information to be able to access your accounts, allow your web developer to work on your behalf and make any changes. That’s it! Aren’t you glad you asked? If you want to develop a deeper understanding of how this all works check out these great articles. Posted in Marketing and tagged web hosting. Totally true!Most also have a backup service so you don’t have to rebuild your site again. Exactly! It’s like insurance for your website! That last point is simply not accurate. It is the hosting company’s responsibility to keep the server secure but no hosting company can take responsibility for what you upload to the server… if you upload insecure software into your website it is NOT the job of your hosting company to secure it. Your site will get hacked and IT is YOUR respnsibility to fix it! Ben, you make a good point in that as a site owner you bear some responsibility for maintaining strong security protocols on your site; avoid using scripts that leave your site vulnerable for example. My point here was simply that the hosting company bears the responsibility to ensure the security of the servers. Thanks! I hope you’re customers find it helpful!